I think only 1 bad point on the gps on the way down. To get to the trail head for this hike, at the CO 9 (Blue River Parkway) and Rainbow Drive intersection, head east on Rainbow Drive. Take a right at the first stop sign, Tanglewood Lane. Head up Tanglewood until you come to Ptarmigan Trail (this is a road not a trail). Turn right on to Ptarmigan Trail. The road climbs and then at the intersection of 2020 it turns into a dirt road. Continue following the dirt road until you arrive at the parking area for the actual Ptarmigan trail. We started the hike at 8:30 in the morning, as usual times are shown on the map based on the gps. The hike starts off through a small grove of Aspens, then rejoins the road for a short distance, then climbs through a Sage Meadow. 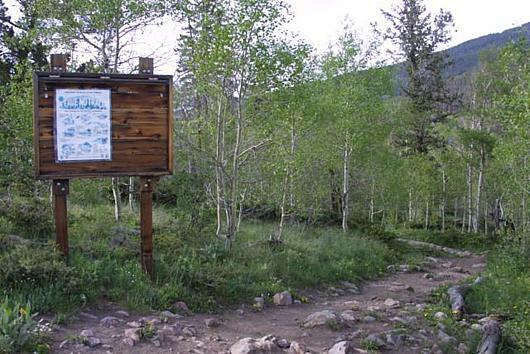 At about 0.68 miles you come to the end of the meadow and a large sign that will indicate you are entering National Forest land. You then get a slight down hill through the Aspens. At 0.85 miles you reach the power lines. At this point the trail splits. Most people continue straight, but there is an alternative by taking a hard right. The straight trail is about a mile longer to the summit and not quite as steep. It offers views of the Gore Range through the dying pines. The steeper way can offer views to the south if you occasionally turn around while you are hiking. I prefer the steeper route. A more in depth description of this route, divided up into sections can be found on my 2006 summit page. 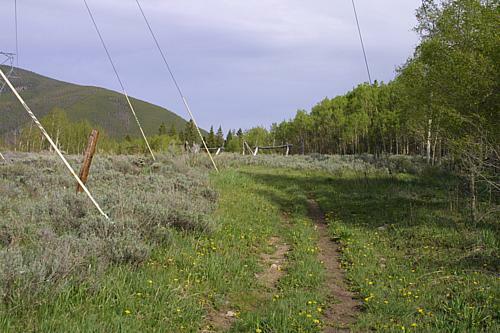 After leaving the power lines the steeper route curves gently around to your left and starts a gentle climb. A little over one mile in, you come to a "T" intersection where you can either go left or right. Go left and continue climbing. This is an old road of some sort and has pits dug into it every 20 to 50 yards all the way to what I call the mini summit. At this point Michael and Madalyn took off ahead of us and we met back up at the mini summit. The map above shows two branch points that you may see on the way up, the first one to your left is a bit hard, the second on your right is easier. Just keep following the pits in the road. When you reach around 11,000 feet in elevation, you start to hit high alpine meadows. Be sure to occasionally stop and look back as the views south are stunning. At 3 miles you hit the mini-summit. At this point the road with the pits ends. Look north and you will see the trail take a slight descent, then climb again. At 3.25 miles you will rejoin the longer trail and enter the Eagles Nest Wilderness. There is a sign here. At this point you are at tree line. Continue up sometimes dodging snow fields as we did until 3.85 miles where there is a sign indicating a trail branches off to Ptarmigan Pass. As of this writing, I have not hiked this. Despite what the profile says, at this point the climb becomes a bit more gentle and the summit is obtained at approximately 5 miles (6 if you took the main route). As we were not the only ones to make the summit we got a group pic. We then moved a bit off of the summit to get out of the wind, had lunch and then descended via the long route. At the Wilderness sign, Madalyn and Michael took off and made it to the car an hour ahead of Marina and Don. On the descent, once you have past the Wilderness sign, you go through a series of switch backs until approximately mile 8.4. At that point you parallel CO 9 continuing a more gentle descent until you rejoin the steep trail at the power lines, at mile 10.25. Watch out for mountain bikers from the Wilderness sign back to the trail head. They sometimes use this trail. At 8.85 miles you will cross a small creek, and again at 9.3 miles. Gore Range Outfitters also uses this trail for some of their rides.